A couple of friends from class and I have made it a point to celebrate the end of our school week, and the start of the weekend by eating dinner at restaurants recommended by each other, others, and just ones we’ve seen before (pretty much anywhere). Last Thursday we went to this Japanese restaurant called Eat Tokyo that was recommended by a Japanese classmate (is it still okay to call university classmates classmates?). We had tried the week earlier, but it was too busy because it was dinnertime, so this time we made it just before the rush and managed to get a table by the window. The restaurant is quite small and cramped, but its seems to be a really popular dining place. By the time we finished, there were quite a few people waiting inside and out, for a table. The lighting is quite dim inside, so if you have poor eyesight, and have reading glasses, don’t forget them! I love salmon, so I was leaning towards getting this dish which was just rice and raw salmon. I really wanted to get it, and I’ll probably try it next time, but I thought I should be more adventurous, so I got Deep Fried Chicken Bento. Yeah, fried chicken at aJapanese place. I’m quite the daring one (note the sarcasm), aren’t I? 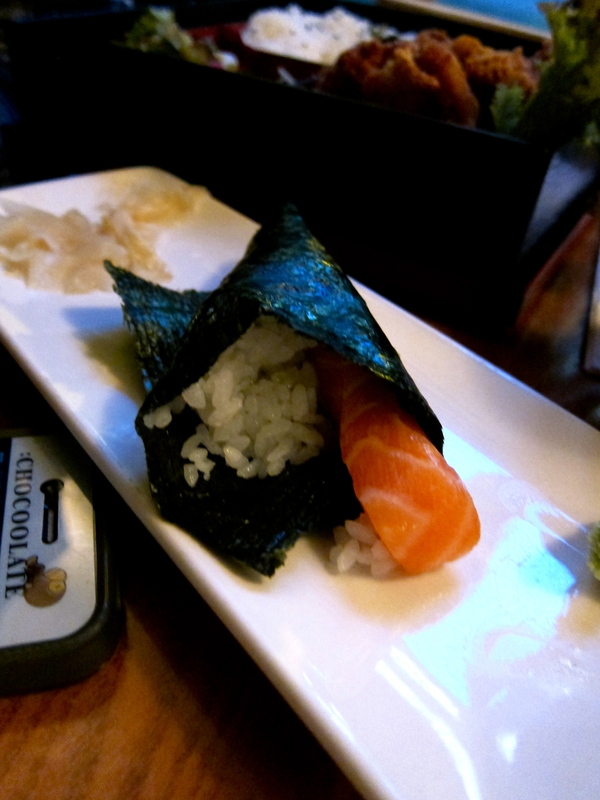 I knew it wouldn’t give me the fix of salmon that I craved, so I ordered a salmon handroll. 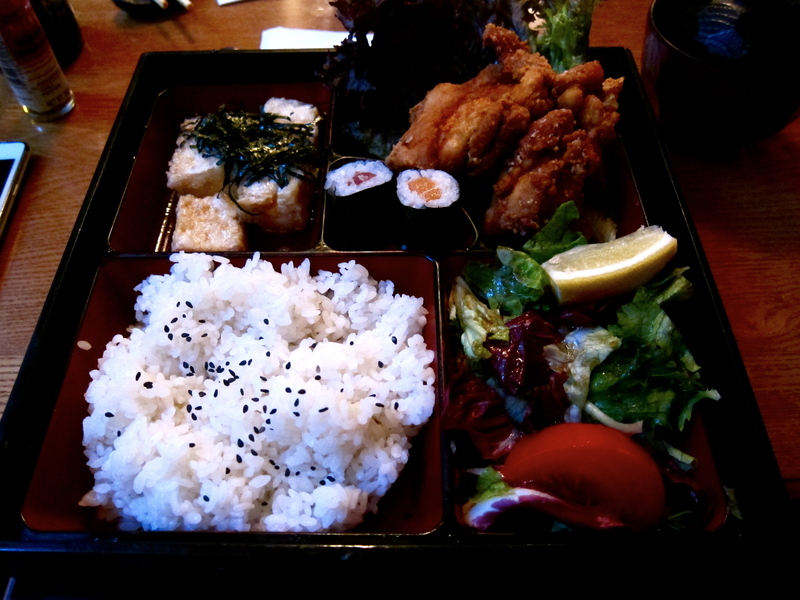 The bento box was alright. The chicken was good, but lacking in saltiness, so I dipped it in soy sauce. Are we supposed to do that? Even in the Japanese fast food joint near my place in Hong Kong I would dip my fried chicken, or fried octopus legs in soy sauce because it just didn’t have enough flavor. I was really just waiting for my handroll. It was not worth the wait. I thought it would have more salmon, and a little more rice too, but of course the food in restaurants rarely stay true to the picture in the menu. Overall, the food was good, and the service was good too. Next time I’ll definitely be ordering me some raw fish.. and rice. There is this turkish restaurant near my church here in London that has an indoor and al fresco dining. It was a really nice day, and if you’ve lived in a city where they are rare (which they are in Hong Kong and London), you’ll learn to take advantage of them, so my friend and I decided to eat outside and enjoy the beautiful weather. 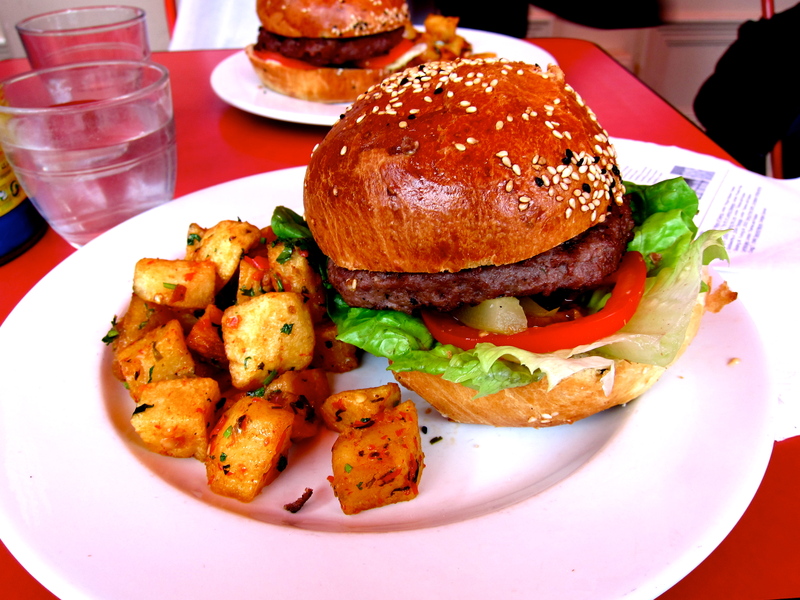 When we were waiting to be seated, I saw someone eating a burger with a side of potatoes. I absolutely LOVE potatoes, and if I could, I would probably live off them, so of course, I scoured the menu looking for this dish. And I found it. So anyways, I ordered the burger, waited for what felt like forever (I was hungry), and it finally came. The lamb burger smelt and tasted amazing. The potatoes to be honest were slightly disappointing. I thought they would be salty, and would taste more… roasted, but they didn’t. It tasted more of a range of different herbs and spices, which I enjoyed. There wasn’t that much service from the servers. Partially because we were sitting outside, partially because they were so busy (it was lunch hour), so it was kind of expected. The only thing I didn’t like (okay the second including the waiting time which was also kind of expected) was the pigeons. This had nothing to do with the restaurant, but oh my gosh the pigeons! They didn’t care about the people sitting there and eating. They flew at every chance they could at bits of food that anyone happened to spill onto the ground. They flew at me and pretty much gave me a heart attack, but I’m alive and well, so its all good. All in all, it was a good meal. For £7-8, it was a little pricey, especially being a student. But coming from another city where you would’ve been able to buy 3 meals for the same amount, it was alright after considering the size, and type of meat the patty was made from.